What would happen if Salvador Dali, René Magritte and M.C. Escher were somehow able to collaborate and make a video game? The closest answer we have so far to this unlikely question is Back to Bed, a puzzle game in which you have to guide sleepwalking Bob back to his bed. The aesthetics in Back to Bed are immediately striking. 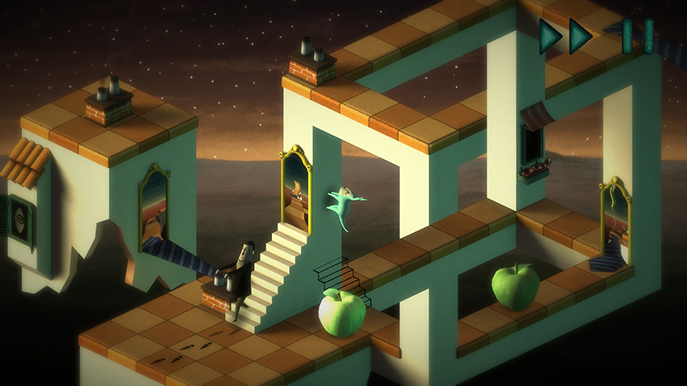 Think of Dali's 'The Persistence of Memory' for the overall art design, with backgrounds mirroring his uses of oranges and blues, Escher's surrealist physic-breaking structures act as the puzzle space and Magritte's 'The Son of Man' gives it's apples which act as your items. You see bowler hats with wings nonchalantly flying around the area and melting clocks slip of the edges of structures. 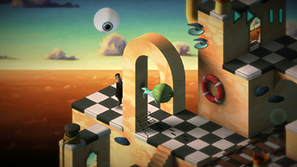 If you're a fan of surrealist art you'll get great pleasure from the look of this game. It looks like a digital recreation of these paintings and it was a real treat to see each level. 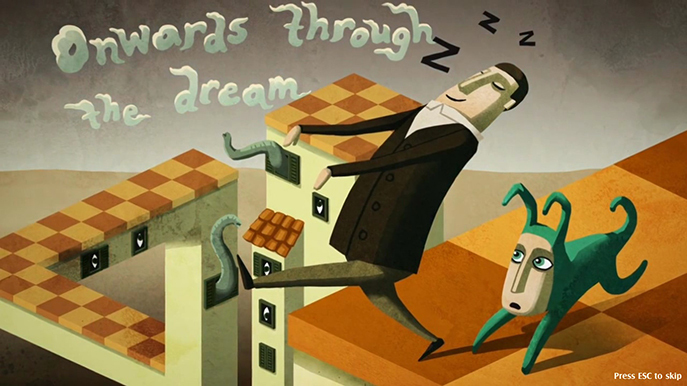 Bob is a sleepwalker in this dream world and it is your job to guide him back to his bed in each level preventing him from waking in the process. You control a four legged creature that seems fitting in this surrealism setting. It is greatly advisable to play with a controller. You control the creature's movement freely while with a mouse it is point and click. Though you can hold the mouse down for fluid movement it is considerably less comfortable and a little tricky when you are required to act quickly. Bob walks in a continuous straight line and turns 90 degrees clockwise whenever he encounters an obstacle in his path. While some of these obstacles are fixed you need to pick up and place apples to guide him past the dangers and back to his slumber. You can also speed up time for when you believe you've found the solution and want to just get to the finish. There are two modes in Back to Bed – normal and nightmare. At the start you can only play the normal levels. After three levels of tutorials you are own your own to protect Bob. The levels start simply and increase in complexity and difficulty on a steady curve. There are transparent stairs that you can use to walk on the walls and the numbers of apples in the levels increase. You'll learn tricks to manipulate Bob's movement to give you a little extra time to consider the solution while preventing him from falling off an edge. Footsteps appear several squares ahead of Bob's path to help you plan the route ahead. As you progress you'll encounter several different types of danger to avoid and fish that you can pick up and place to bridge gaps in the scenery. You'll find helpful objects that interact with Bob, such as portals and pipes that blow him across a few squares. The atmosphere is great. The colour palette is truly reminiscent of the artists it takes it's inspiration from, the sound is apt for a dream world and the occasional voiceover speaks in a deep, broken and slightly disturbing tone. The colour shifts as soon as Bob is nearing danger and the scream as he wakes or plummets is notable. If Bob falls over an edge he drops again in his starting position and immediately continues his walk. If he succumbs to one of the dangers you need to restart the level from the beginning. There are occasional transitions with really well done artwork giving a little bit of story, though they looked a little lacking in quality at the high resolution I was playing at; like they had been enlarged to fit the screen. 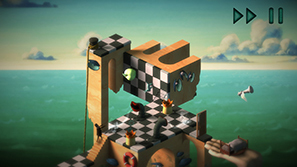 Inventive and varied puzzles populate Back to Bed throughout. In some of the levels the solution is immediately apparent. However, there are some which take a little more thinking before the path becomes clear. Due to the trial and error nature to some of the puzzles you'll discover certain tricks that you can utilize skilfully in later levels. While some of the later levels certainly get tricky I never really encountered any problems and completed all thirty levels in seventy minutes. It was very satisfying and enjoyable to go through but I do wish it was a little more challenging. It experiments a little with optical illusions as part of the puzzle layout in later levels but never really expands on it. I would have been really interested if they explored that further, it certainly fitted with the Escher inspired level layout. Completing Back to Bed unlocks nightmare mode. I had high hopes that this would provide me with a sterner challenge but unfortunately, it did not. There are the same thirty levels that you've just played through in normal mode but with one difference. 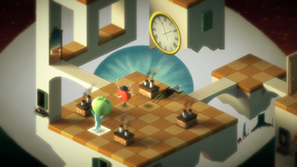 Keys are scattered in the levels and you have to guide Bob on to the square it sits on and collect them all in order to unlock the door to the bed. While this did provide some challenge – the keys are in awkward positions – having just completed all of these levels in normal mode led me to know the solution to each and every one already. I was so familiar with the layout and what I needed to do making a slight detour to collect the keys wasn't much of a deal. I would have liked it if this mode was available from the start, with some advice that this should be played by people looking for a challenging experience. They could have also removed the footsteps ahead of Bob to make the player think harder about the exact route he will be taking. Sadly, this mode is a little wasted. It took about fifty minutes to clear this mode though I encountered a bug in 2-10 which left me unable to complete the level. At a wall that Bob was supposed to turn at he would always walk through it and fall off the edge. I hope this issue will be fixed in time for the release. 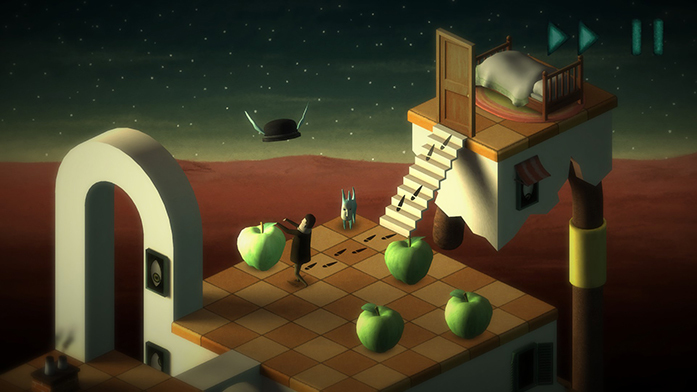 With phenomenal presentation and clever and fun puzzles, Back to Bed is a great experience. While it doesn't take long to complete, what is there is worth your time and the price is appropriate. I had hoped for something slightly more challenging but what is there is engaging and enjoyable. 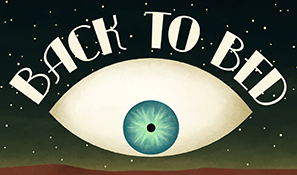 If you're a fan of puzzle games or the aesthetics of the aforementioned surrealist artists I highly recommend you spending the two hours it takes to go through all the game has to offer.